Oh come on are you telling me that facial wipes are an issue. Yes we are. Many are pretty synthetic and naff. 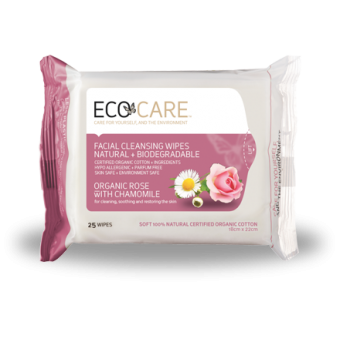 ECOCARE™ is Premium Organic Skincare at its best due to it's touchy, feely 100% organic cotton structure and delicious satisfying natural aromas. 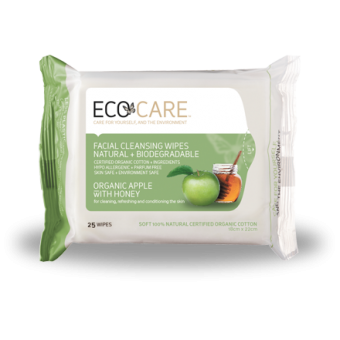 Ecocare has a passion for organic, natural and sustainable products. Ecocare's eco-centric philosophy pushes the boundaries resulting in beautiful products that are as safe for the skin and the earth as possible. We want to provide you the opportunity to care for yourself, and the environment. You really shouldn’t leave home without these facial wipes. You really shouldn't. Great for travel, holidays and everyday hygiene and also good at removing make up.